This is fabulous and beautiful with the speckling of spice. It’s also not as overpowering as a standard pumpkin pie may be to some. Picture at left is pre-baked in a water bath. Preheat your oven to 350 degrees. Place the cream cheese and eggs on your counter for at least 30 minutes while the oven is preheating. Make the crust by combining all the crust ingredients into a medium bowl and stir well with a fork. Empty this into the springform pan and gently shake and tap the pan on the counter to distribute the crumbs. Gently press the crumbs into the bottom and just a tad up the sides of the pan as you turn the pan. Bake the crust for 5 minutes then set aside to cool. 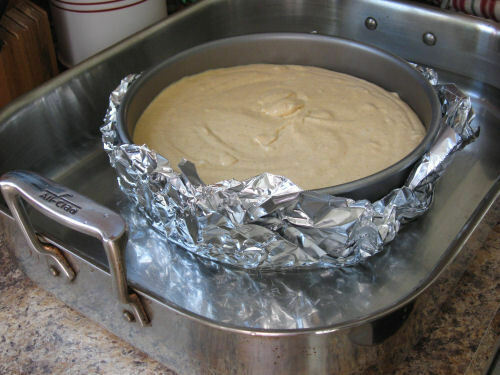 Wrap the springform pan in a double layer of heavy duty aluminum foil – you will be baking the cake in a water bath (no cracks) and this will prevent spillages. Place the wrapped springform pan inside a large pan with high sides (such as a roasting pan). Now make the filling – in a large mixing bowl combine the cream cheese, 1 cup sugar and the vanilla. Mix until smooth – about 2 minutes. Add the pumpkin, eggs, and spices and continue to mix for about 1 more minute. Pour the batter into the pan. Slowly and gently fill the larger pan with hot water (6-8 cups, depending on the size of your large pan) until it comes about halfway up the sides of the spring form pan. Place the whole thing into the oven and bake for 60 minutes. DO NOT OPEN THE OVEN. After 60 minutes, turn off the oven and let the cake sit in the closed oven for 1 hour. Remove springform pan from larger pan (don’t remove the foil) and place pan on a rack for about 3 hours to cool. 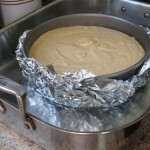 Now remove the foil and place cheesecake (springform and all) on a plate, then place another plate on top of the springform pan as a cover and place in the fridge at least overnight so it can set. Remove sides before cutting.